Competitive Edge Products, Inc is happy to present the brilliant 5HNBA2 Spalding Junior Portable Basketball System. 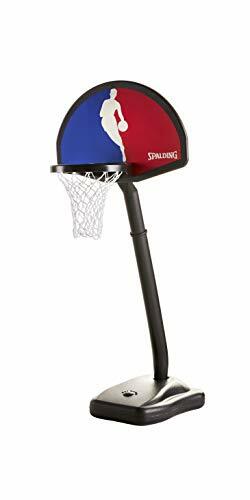 The Spalding Junior Portable Basketball System offers an adjustable height from 32" to 52" to grow with your kids! 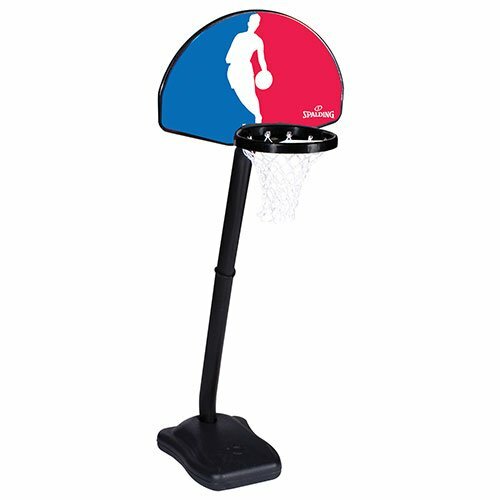 With a 24" reinforced, stable backboard, 10" hoop diameter, and 5" inflatable ball, this basketball hoop is certain to provide hours of entertainment. The gallon base must be filled with sand or water for safe stability. This hoop can be used indoor or outdoor. Measuring 31.5" in length, 7.5" in width, and 16.8" in height, this hoop has attractive NBA graphics on the backboard. 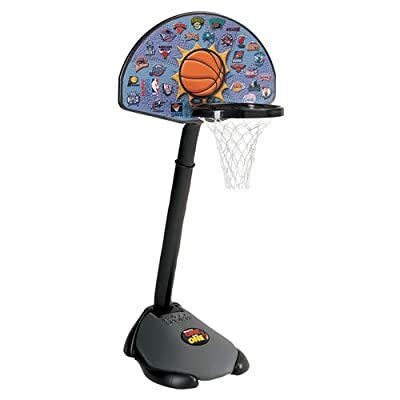 Designed for kids aged 5 and up, this hoop provides a molded slam rim for added fun. 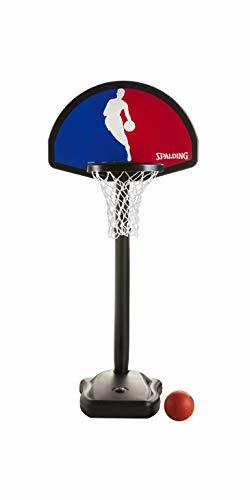 Keep your kids active and instruct them hoops skills at a young age with the Spalding One-On-One Junior indoor/outdoor portable basketball system, which showcases amazing NBA group graphics on the 24-inch large fan-shaped backboard. It easily adjusts from 32 to 52 inches in height to grow with your youngster. It also features a 10-inch diameter formed slam rim and 5-inch inflatable basketball. 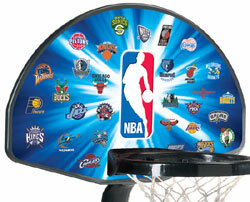 The backboard consists of logos from all NBA groups. It's stabilized by a 1-gallon base, which holds either water or sand. Needs no devices for installment. As a Division of Russell Company, the Spalding Team consists of 3 business devices: Spalding in Springfield, MA; American Athletic, Inc. (AAI) in Jefferson, IA; and Huffy Sports, in Sussex, WI. The 3 companies, jointly incorporated, are now the largest basketball equipment provider on the planet. Spalding is the official basketball provider of the National Basketball Association (NBA) and Women's National Basketball Association (WNBA), the official backboard of the NBA and NCAA, the official volleyball of the King of the Beach Volleyball Trip and the official football of the Field Football Organization (AFL) and Pop Warner. Play basketball wherever with this colourful, sturdy, portable basketball system. Contains ten-Inch rim and 5-Inch inflatable basketball. 1-gallon foundation can be crammed with sand or water. Calls for no equipment for set up, suggested for ages 5 and up.